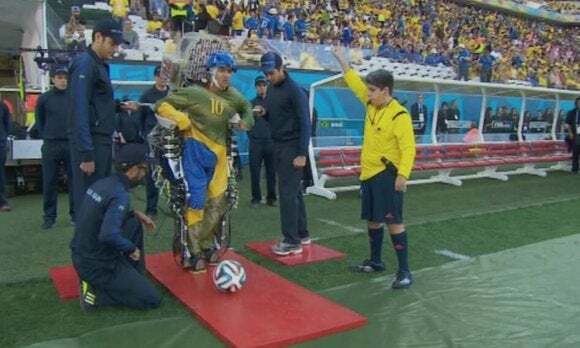 It lasted only two seconds, but a paralyzed man made history Thursday when he kicked off the World Cup in Brazil with the help of a robotic suit. Juliano Pinto, 29, was seen in a short YouTube clip kicking a soccer ball while wearing the exoskeleton at the Corinthians Arena in Sao Paulo. He then raised his fist in the air. The feat was backed by Walk Again Project, a nonprofit group involving U.S. and European universities and other organizations as well as more than 100 scientists. It posted the video on Twitter. “We did it!!! !” tweeted neuroscientist Miguel Nicolelis of Duke University Medical Center, who led the construction of the exoskeleton. Electrodes under a cap worn by the user detect brain signals and transmit them to the exoskeleton that translates them into steps or kicks, according to Colorado State University (CSU), whose vice president for research Alan Rudolph is a project manager for Walk Again. CSU researchers developed a 3D-printed polymer liner in the cap to keep the electrodes in place and also contributed special brackets on the cap that hold LED sensors providing feedback to the user showing how well he controls the exoskeleton. The user also receives tactile feedback from artificial skin in the suit developed by Gordon Cheng at Technical University of Munich (TUM), a partner in the Walk Again Project. The artificial skin, consisting of flexible printed circuit boards, sends signals to small motors that vibrate against the user’s arms, helping guide the robotic legs. The project’s origin, according to TUM, lies in an experiment in which Nicolelis had a monkey walking on a treadmill in North Carolina while Cheng had a humanoid robot in Kyoto, Japan, follow the signal generated by the monkey’s movements. “After the Kyoto experiment, we felt certain that the brain could also liberate a paralyzed person to walk using an external body,” Cheng said in a statement. The World Cup event is “the beginning of a future in which the robotic garment will evolve to the point of becoming accessible and enabling anyone with paralysis to walk freely,” Walk Again said in a statement. But improvements to the bulky, heavy mechanisms will be necessary before the technology can take off. Strength-boosting exoskeletons developed for people who can move their limbs or have partial movement, such as Cyberdyne’s HAL suit, tend to be lighter. “Robotic exoskeletons remain in the very earliest stages of development,” Francis Collins, director of the U.S. National Institutes of Health, wrote in a blog post after seeing a demo of the machine in Brazil.